The life of a Roman legionary (legionarius) was beyond all doubt very difficult and demanded enormous stamina. Volunteers (or recruits) were very often not sure whether they would come back home after sixteen years of service (in 5 CE the length of service was prolonged to 20 years). Both the legionaries’ duties and the discipline were supposed to create true men out of them, ready to win the battle against the stronger enemy. The legionaries were recruited between the age of 17 to 20 for sixteen years of service (The Marian Reforms). 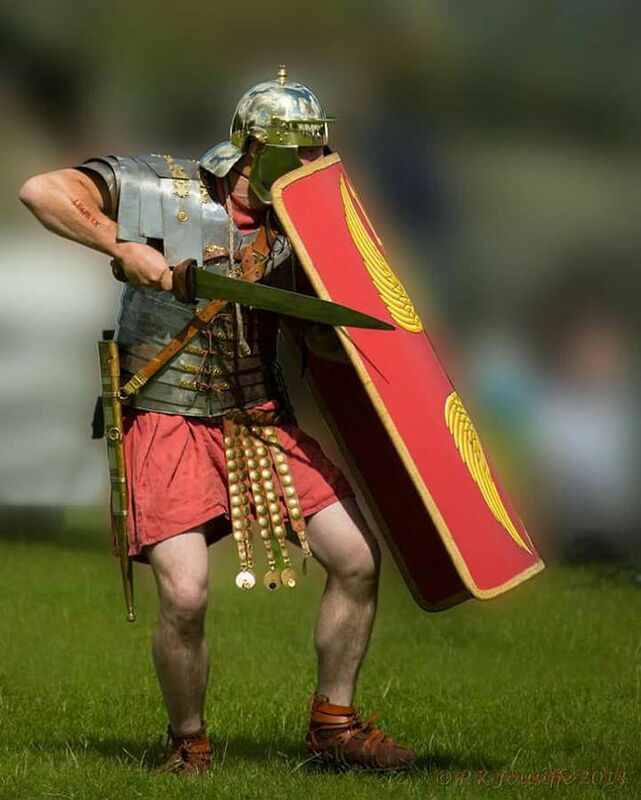 An average Roman legionary was barely 1.68 m tall which is considered to be the biggest weakness of Roman soldiers. Scientists explain the Romans’ short stature with their diet, as it was based mainly on flour products whereas the barbarians ate meat high in proteins. 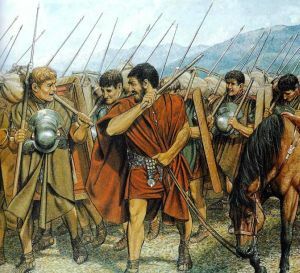 After hard training and everyday military drill, Roman legionaries were able to march 37.5 kilometers a day with the baggage weighing even 36 kilograms. The height of an average man was confirmed by Geoffrey Kron’s research, conducted on 926 adult male skeletons buried in Italy between the year 500 BCE and 500 CE. They were approximately 1.68 m tall. Perhaps there was a height selection introduced to Roman army for the legionaries had to keep alignment in the right order (e.g. testudo). For comparison it is worth mentioning that the Germans or Galls were reaching averagely the height between 1.70 to 1.85 meters. Although the Romans were shorter than their enemies, they possessed much greater skills. They had the ability to cooperate, fight in different weather conditions, were disciplined, well equipped, trained and tough. After hard training and everyday military drill, Roman legionaries were able to march 37, 5 kilometers a day with the baggage weighing even m 36 kilograms. Gaius Marius’ one exercise was a long-distance run with full equipment. 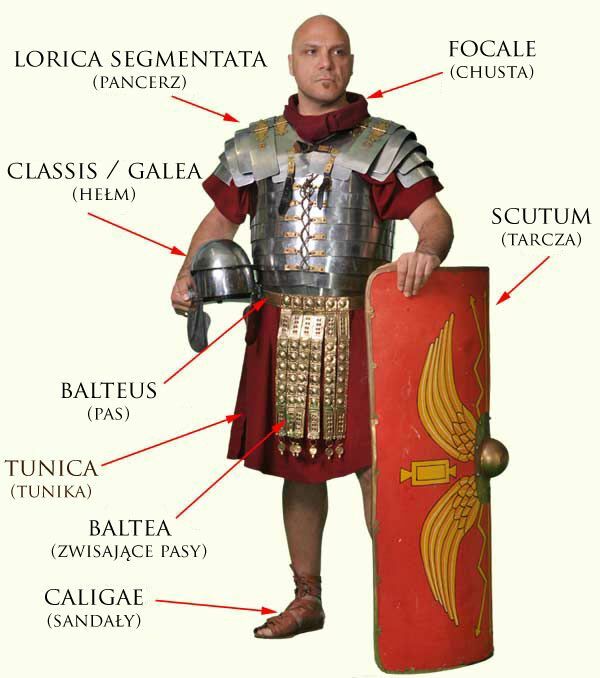 The image of a legionary in the beginning of the Roman Empire. More about equipment here. From the very begging the young recruits’ previously acquired abilities were being properly used. If someone used to be a smith, he became an armourer, a shoemaker sewed shoes for the soldiers and those who were specialized in the wood processing built war engines. If somebody had no such ability, he could easily became a member of the surveyors group or the one responsible for cleaning the roads. 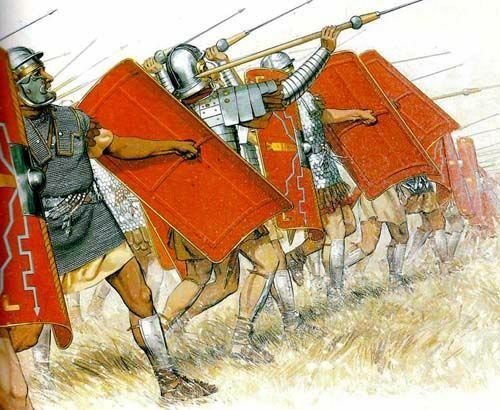 Those were the legionaries’ duties when there were no battles, but once the trumpets gave a signal to fight, all of them were to be ready at their post and fully armed. There was a division into experienced, veterans and the young ones. 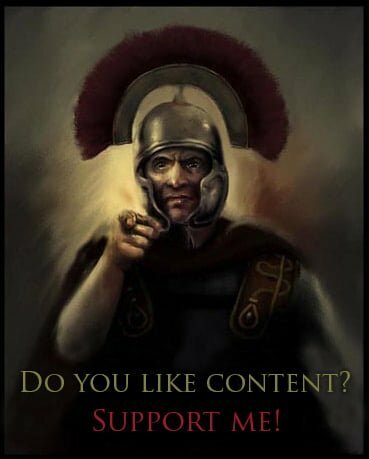 The older and more experienced legionaries were telling stories and teaching the younger generation how to behave on the battlefield. Also the functions differed. The veterans were seeded to the middle of the fight or somewhere they could clinch the result of the battle and the younger soldiers’ main aim was simply to immobilize the enemy. 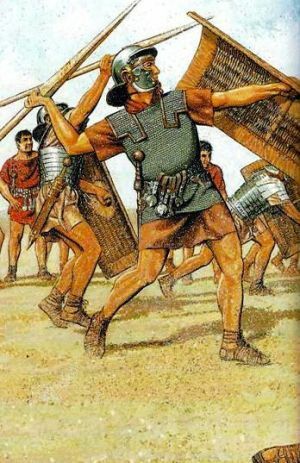 Legionaries throwing pilum. After throwing a pilum and reaching the target (eg. shield) the neck of the javelin often bent or broke preventing movements or forcing an adversary to drop the shield. The matter of food is also worth mentioning as it was far different from what we can imagine nowadays. Bread was the major component of the legionaries’ diet – daily wheat ration was approximately 8.7 litres. They ate hardly any meat or vegetables which were considered not valuable. The small portion of proteins consumed by the Romans was the reason for their poor bones’ growth and, as a result, for their short stature. On the other hand, as it was already mentioned, the main component of Gallic and Germanic diet was meat. Of course it does not mean the Romans were only vegetarians. In their menu there were also such things as beaf, pork, lamb and game. In Britain venison or goat meat was available whereas in Egypt it was possible to get veal and different fish species. Roman legionaries were drinking diluted wine (daily ration approximately 0, 27 litres) or beer. It happened sometimes that the larger amount of alcohol led to some struggles. According to Tacitus, a historian of Roman Empire, once when legionaries and Gauls from the auxiliary formation were feasting together in Ticinium in 69 CE, a friendly wrestling competition turned into a fight as one of the Gauls started to laugh at a defeated Roman soldier. The struggle quickly boiled in to a riot and about 1000 people were killed as a result. 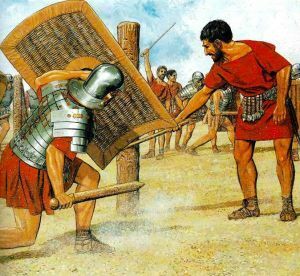 Roman soldiers developed a particular way of sleeping during the watch – bracing with the whole body on the shield. Also the soldier responsible for building the camp once caught without his glades was condemned to death. 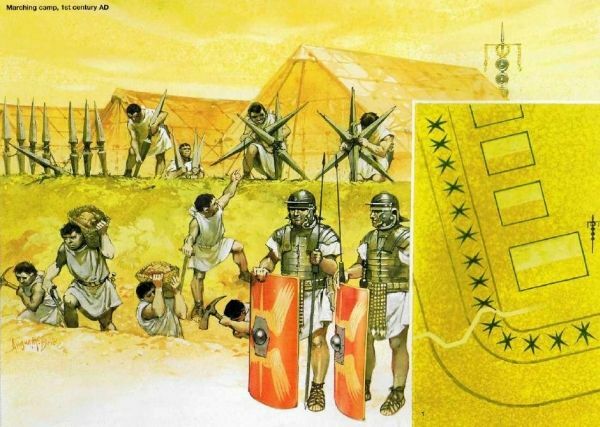 The Roman army was highly disciplined which was mainly the result of tribunes’ and centurions’ inspections. The general review of a drill, soldiers’ tasks or checking a state of the weapons were considered encouraging. It was both the way to organize well their free time and form a habit of reliability and responsibility for the military property. The reality of Roman army was well known by Publius Flavius Vegetius Renatus, Roman historian and writer from the second half of the 4th century. He was a treasury administrator was keen on military and horse breeding. His opus magnum is (Epitoma rei militaris) dedicated to the reigning emperor (probably Theodosius). It consists of 4 books and is the only survived ancient manual of Roman military. Vegetius’ main idea was his deep belief that once the strict discipline from the past would be restored in Roman army, so would be the power of Rome. In the epitome he describes for example the adaptation of the Hunnic Composite Bow but he mainly focuses on the battle techniques and war tactic. The centurion in the infantry is chosen for his size, strength and dexterity in throwing his missile weapons and for his skill in the use of his sword and shield; in short for his expertness in all the exercises. He is to be vigilant, temperate, accive and readier to execute the orders he receives than to talk; Strict in exercising and keeping up proper discipline among his soldiers, in obliging them to appear clean and well-dressed and to have their arms constantly rubbed and bright (…) The splendor of the arms has no inconsiderable effect in striking terror into an enemy.. Can that man be reckoned a good soldier who through negligence suffers his arms to be spoiled by dirt and rust? Centurion at the head of the Roman contingent. Nothing does so much honor to the abilities or application of the tribune as the appearance and discipline of the soldiers, when their apparel is neat and clean, their arms bright and in good order and when they perform their exercises and evolutions with dexterity. Of course the legionaries were prized for an extraordinary engagement in the exercises and fulfilling their duties. […] A commander-in-chief therefore, whose power and dignity are so great and to whose fidelity and bravery the fortunes of his countrymen, the defense of their cities, the lives of the soldiers, and the glory of the state, are entrusted, should not only consult the good of the army in general, but extend his care to every private soldier in it. For when any misfortunes happen to those under his command, they are considered as public losses and imputed entirely to his misconduct. If therefore he finds his army composed of raw troops or if they have long been unaccustomed to fighting, he must carefully study the strength, the spirit, the manners of each particular legion, and of each body of auxiliaries, cavalry and infantry. He must know, if possible, the name and capacity of every count, tribune, subaltern and soldier. He must assume the most respectable authority and maintain it by severity. He must punish all military crimes with the greatest rigor of the laws. He must have the character of being inexorable towards offenders and endeavor to give public examples thereof in different places and on different occasions. […] he beat me all the more… goods… or pour them down the drain. As befits an honest man I implore your majesty not to allow me, an innocent man, to have been beaten with rods and, my lord […] as if I had committed some crime. 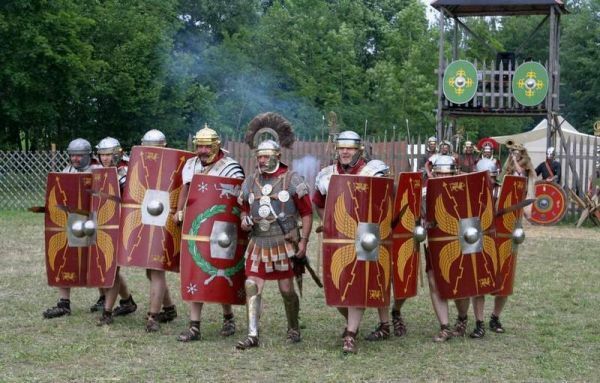 During festivals and holidays Roman legionaries used to meet on a feast organized by the military clubs collegia militares, which were responsible for taking care of the soldiers. Sometimes next to the walls there were built quite large amphitheaters for the gladiator fights. For instance, the auditorium in Careleon in Wales could sit even 6000 people whereas the one in Carnutum in Austria could sit even bigger audience. In Roman camps there were also baths which performed not only hygienic but also integrative function. It was possible either to clean the body and exercise or enjoy wine with friends in the entertainment room. Most of all, the recruits had to learn a long-distance march – every month the soldiers had to travel the distance of 30 kilometers, fully equipped. Half of the distance they marched, the other half – run. They were also taught how the build a camp, they practiced stone throwing, swimming and horse riding. Twice a day they exercised (veterans only once), they had to learn how to jump on and off the horse (from both sides which was no mean feat taking into considerations that there were no stirrups then) with full equipment. Nonetheless the most important of all was the ability to use the weapon. The stake was fixed in the ground, about the height of a human being. The soldier armed with wicker shield and wooden, blunt sword (lat. rudis; even more heavy than a normal one) attacked the stake and exercised. Moreover, he had to throw a pilumand participate in pretended battles whereby the weapons were protected with cases in order to avoid any potential injuries. In the reign of Augustus (27 BCE – 14 CE) the legionaries were forbidden to marry with the aim of keeping the discipline and not attaching the soldiers to the place they were stationed. Theoretically, the law stood for the next two centuries however, given that the service lasted 25 years, it was impossible to expect from the legionaries that they would not marry and start a family. In view of the fact that their place of living was associated with the military unit they served in, most of the soldiers married local women. Their relationships were recognized by the army but not by the country. It is worth mentioning that a legionary was perceived by the women as a good catch as he had a steady income and guaranteed stabilization. Children from such marriages very often maintained family tradition and joined the army which was not meaningless in the time of recruitment crisis. Boys joined their fathers’ units and had a career in the army. The officers winked at the soldiers sneaking out to their families living outside the fort. Furthermore, it happened sometimes that a cohabitant moved into the camp with children to share contubernium with her husband – there is evidence for that, some articles of daily use found in the barracks. And if god should be willing, I hope to live frugally and to be transferred to a cohort; but here nothing will be accomplished without money, and letters of recommendation have no value unless a man helps himself. How was a Roman legionary perceived? 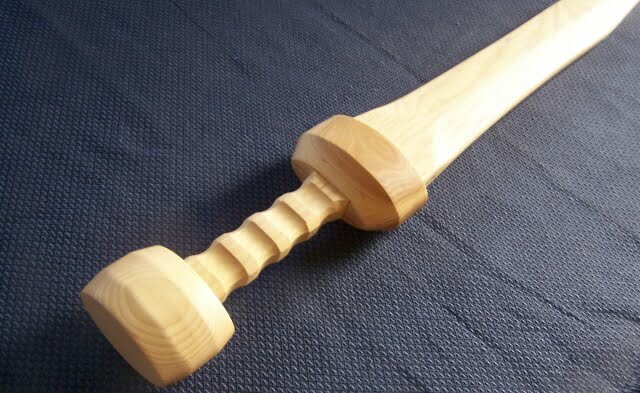 Rudis was a wooden sword used by the legionaries during their exercises. Also gladiators were given rudis as a symbol of freedom. In the judgments of those more favorable people, such as Plutarch, Augustus’ reform was perceived as a fruition of Plato’s conception presented in Republic – permanent, well trained army. The legions were seen as a group of soldiers-citizens favored with service because of their natural abilities, developed by training. Those people let the rest of the citizens devote themselves to their professions. Thus they were not soldiers out of necessity. Plato wanted the army to receive a payment sufficient to fulfill their needs, as a compensation. Interestingly, Plato’s supporters believed that soldiers had to fulfill particularly strict moral requirements. This belief was clearly present in the nomenclature used eg. by Dio Chrysostom who officially called the soldiers of the Late Roman Empire the noblest (gr. gennaiataioi). Cassius Dio’s conception seems to be much more realistic. It simply says that if utility overweighs integrity, then the stronger and poorer (mainly criminals) should be used for common good. It may be treated as an unusual way of adjustment to the times when money mattered more than glory. Even in Horace’s poems a soldier appears as the one who needs to disown his otium (free time), get rid of personal liberty and subject himself to the authority in order to earn money for not so prosperous senectitude. As a result of forming professional army many citizens could devote themselves entirely to their professions and therefore probably enjoyed being released from their military duty. Of course it did not interfere them in grieving in public for “the old Roman morality and mentality”. According to the other conception a soldier had a position of a degenerate citizen-decadent and could be consequently considered as such despite the fact that most of the soldiers were citizens or foreigners trying to become ones. At Tacitus we can observe a particular reversal of platonic standards. The noble anger characteristic for the first soldiers turned into ira or furor which means fury and ferocity. It made a good-natured platonic soldier (whom nota bene Plato called A Purebred Dog) a beast lusting only gold and sometimes glory. In the name of those such a beast was able to lay a hand on this common good which he had promised to protect. Such ideology, especially in the 4th century CE had a strong impact on upper class. It created the image of a soldier who should be from a lower class, separated from the rest of society and being paid frugally in order not to make him too proud and, finally, he should be completely obedient and subject to a strict discipline. Those harsh requirements were being motivated by the statement: “if the platonic dog became a wolf now it is the commanders’ responsibility to make him come to his senses”. The Roman legionary, depending on circumstances filled with either respect and admiration or fear and contempt.